Every year Google Summer of Code pairs university students with mentors to hone their skills while working on open source projects, and every year we like to post wrap-ups from the open source projects about their experience and what students accomplished. Stay tuned for more! 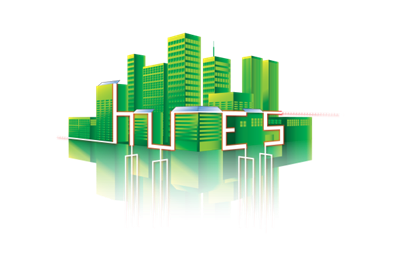 The Holistic Urban Energy Simulation (HUES) platform is an open source platform for facilitating the design and control of renewables-based distributed energy systems. The platform is an initiative of the Urban Energy Systems Laboratory at Empa in Switzerland, in collaboration with our research partners at ETH-Zurich, EPFL, the University of Geneva and the Lucerne University of Applied Sciences. As we push towards the second version of the HUES platform, we had help from three bright and enthusiastic students as part of the Google Summer of Code (GSoC). People in cities are suffering more and more from scorching heat, caused by global warming and bad urban planning. This traps heat inside cities and has led to soaring air conditioning demand, making cities even hotter - a vicious circle! Clever bioclimatic urban design can mitigate urban heat by facilitating the use of natural ventilation and guiding air streams. 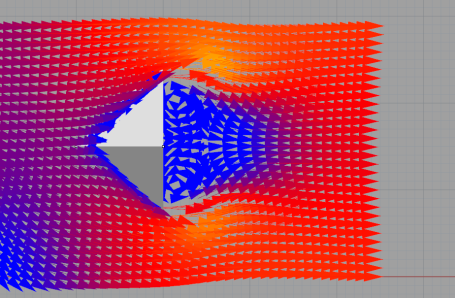 However, the simulation of wind flow is a computationally and technically demanding task. There is a need to provide urban planners and architects with a tool able to predict wind flow patterns in real-time to facilitate development of energy efficient and passive designs. Lukas Bystricky, a student at Florida State University, developed a Fast Fluid Dynamics (FFD) library in C# exactly for this purpose. Lukas’s implementation is based on the paper by Jos Stam (1999). 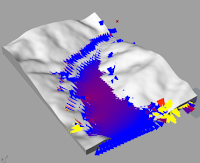 In contrast to the original implementation, where a cell centred finite difference is used to discretize the equations, Lukas applies a staggered grid finite difference, which is the standard finite difference in Computational Fluid Dynamics (CFD). This is done to prevent spurious pressure oscillations near the boundary which can occur in cell centered finite difference for the Navier-Stokes equations. This does not change much in the algorithm or solvers, but makes enforcing the boundary conditions significantly more complicated. So far, Lukas uses a simple Jacobi solver as linear solver, as was the case in Stam's original implementation, but he plans to replace it with more efficient solvers in the future. Also, he is validating his library with typical benchmarks. We are now coupling Lukas’s library into our HUES platform, more specifically into the 3D CAD software Rhinoceros and its visual programming platform Grasshopper. The final goal is to have an intuitive real-time visual design tool of wind flow for urban planners and architects. Also, we will use it to couple it to whole year dynamic building energy simulation programs, to better capture microclimatic effects of the urban context in simulating building energy consumption of designs. Distributed energy system components are modular in nature and interact across multiple scales. As such, there is a need for a modeling framework that can easily construct and configure systems of modular entities (energy demands, sources, converters, storages and network links) across scales. Frederik Banis, a student at the University of Applied Sciences Stuttgart, developed a modular approach to modeling distributed multi-energy systems (energy hubs) in Python, based on the Open Energy System Modelling Framework (Oemof) and Pyomo. In the developed framework, energy systems components are specified in a common format allowing for easy duplication and reconfiguring at larger scales. The platform enables easy manipulation of an energy hub grouping multiple components (demand, sources: electricity, natural gas; systems: photovoltaic panels, wind turbines, gas boils, combined heat and power engines, etc. ), as well as copying it (from hub1 to hub2) to create a larger interlinked system (district) where multiple energy hubs are connected. This hierarchical nested structure can be repeated as needed, and detailed results about the energy supply of each technology or energy stream can be analyzed in the form of different plots for each system or sub-system. The HUES platform includes a growing array of datasets describing the technical and economic characteristics of distributed energy technologies. Currently, this data is stored in separate modules using different data structures and file formats, making it difficult to explore holistically and query systematically. To address this, GSoC student Khushboo Mandlecha has developed an open source database to enable the linked exploration, querying and visualization of data in the platform. The first part of the project involved the development of server based scripts to automatically extract relevant data from the modules of the existing HUES platform, and write this data to a common database. A standard format for technology component data was developed, enabling users to upload technology data files to be stored in the new database. The new database has been developed in MongoDB, enabling fast data retrieval and allowing everything to be retrieved in the form of JSON objects. The second part of the project involved the development of a web-based portal for querying, visualizing and downloading data. Once this portal is complete, it will be possible to visualize the contents of the database in different ways, enabling users to get a sense of the distribution of property values and facilitating the identification of outliers. Ultimately, the database will help researchers and practitioners using the HUES platform to develop models and perform comprehensive analyses of distributed energy systems.